I see a lot of questions in the various Facebook groups I’m in about what the best printers are for printables that won’t completely wreck your budget in ink costs. It seems like a really tall order. Most at-home printers weren’t made for art quality prints and these days ink cartridges cost almost as much as a printer. Add in the fact that the quality doesn’t even last until the end of the cartridge (is there anything more frustrating than seeing those faded lines on a beautiful printable you just purchased?) and you have a recipe for frustration. I know, because I just went through this same process. And finally threw up my hands and decided it was high time to buy a good printer that I could rely on. But if you know me, you know I don’t do anything without a ton of research first. So I started scouring the internet for reviews, information, comparisons and more before I even thought about purchasing a printer. And I found one I love, and gives me all the quality I wanted and needed with ink that lasts for forever. Then I realized given all the people that have the same frustrations and questions – why not share the research I did? Note: This post contains affiliate links, which means that through no cost to you I make a small commission if you purchase through my links. Read more about this in my disclosure policy. Let’s just get the hard truth out of the way. Those basic desktop printers that you can pick up at your local box store for $49.99 are going to give you exactly the kind of quality you’d expect. Plus, they’re likely to be slow and are going to bleed you dry in ink costs. They are made to print the occasional document or photograph. They were not designed or made to regularly print high quality 300DPI full color pages. This was a hard one for me to accept because I really didn’t want spend more than $50 on a printer. But, I realized if I was going to spend good money and time on paper and printables then I was going to make sure that I had a printer that could give me the quality I wanted. There are four big-name printers out there – Brother, Epson, Canon, and HP. They all have their pluses and minuses, and you might be devoted to one or another brand. Let’s start with HP. They have recently come out with a really popular program, HP Instant Ink, where you can sign up for a monthly printing allowance. The pricing tiers start at free for 15 pages a month and go up to $9.99 for 300 pages. They allow you to rollover up to 100 pages, and each additional 25 pages beyond your allowance are $1. As part of the program, you connect your printer and HP monitors the levels of ink you have. When you get low, HP automatically sends you more ink in the mail. No ordering, no piling up of ink cartridges you don’t need, and no forgetting what design number your printer is when you’re already at the store ready to buy (please tell me I’m not the only one grumbling to myself about how I need to tattoo that number somewhere so I don’t forget again). The benefits of the program are supposed to be that you save money on ink cartridges and you have the convenience of getting them send to you. Not bad! This also means if you do decide to get one of the more basic 3-in-1 models that you at least get a little reprieve from the ink costs! On the far end of the spectrum for the best printers for printables are Brother Printers. They are well known in the printing community for being high quality and reliable, albeit a little pricey. This Brother Printer can manage up to tabloid size printables (11×17), which means you can print papers for signatures that will fold to standard letter size. And similar to the HP Instant Ink program, this Brother Printer is Amazon Dash Replenishment enabled. In other words, when its set up and enabled, it automatically senses when you need more ink and orders it for you through Amazon. Epson also has a great reputation in the printer world, and has some of the best printers for printables. In fact, a number of people who offer print services alongside their printables use Epson Eco Tanks. And while they don’t yet have an ink replenishment program they do have a really great alternative – Eco Tank printers. While they are pricey, they come with enough ink for up to two years or 5,200 pages – whichever comes first. They also have see-through tank windows so you can stay ahead of low ink and avoid those dreaded lines. Ink refills come in bottles that you can purchase separately when needed! Canon has a very impressive line of printers, and with a fantastic reputation in the photography community you can be sure that your full-color prints will look amazing. That was so important to me when I was looking for a printer for my printables. I was willing to sacrifice a lot of other things in the name of quality, but luckily I didn’t have to. This is the printer I decided to upgrade to, and I love it. It’s ridiculously fast and my printables come out looking amazing. 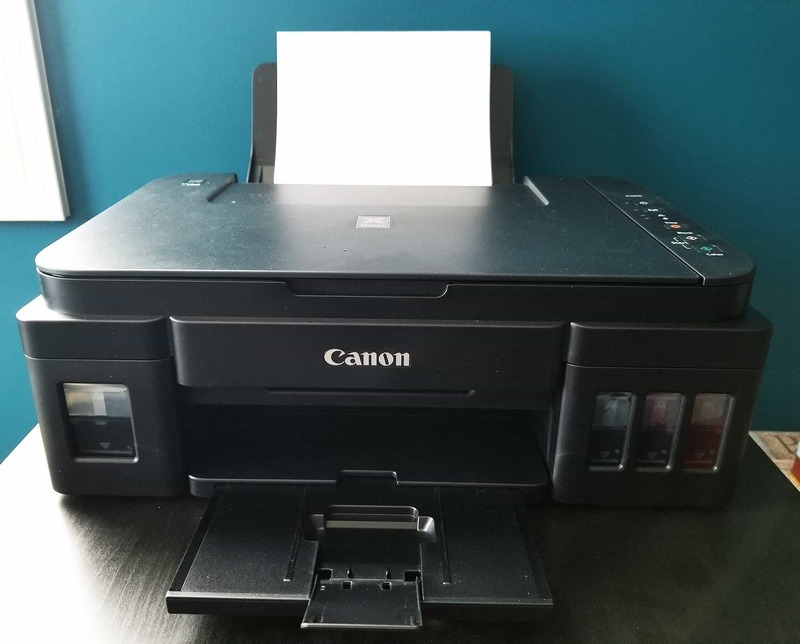 Much like Epson, the Canon Megatank features large ink wells that can be seen through clear windows on the side of the printer and comes with enough ink for up to 2 years or 6,000 pages. It was a bit of an investment, but I know that I’ll save twice that much in ink costs alone! And one of my favorite features is borderless printing, which is perfect when you’re trying to print patterns or dot grids. I hope this guide helps you find the best printers for the printables that you love!